Yesterday it was 55 degrees and sunny. Today its supposed to be 70 with bright skies, so I’m headed out a little later with a new hunting buddy, Josh, going back to the second 1870 house that Tom and I scanned last weekend…hopefully, with better results. Josh, an Army vet, went to high school with my oldest son and now has entered our hobby kindom with a Garrett AT Pro. 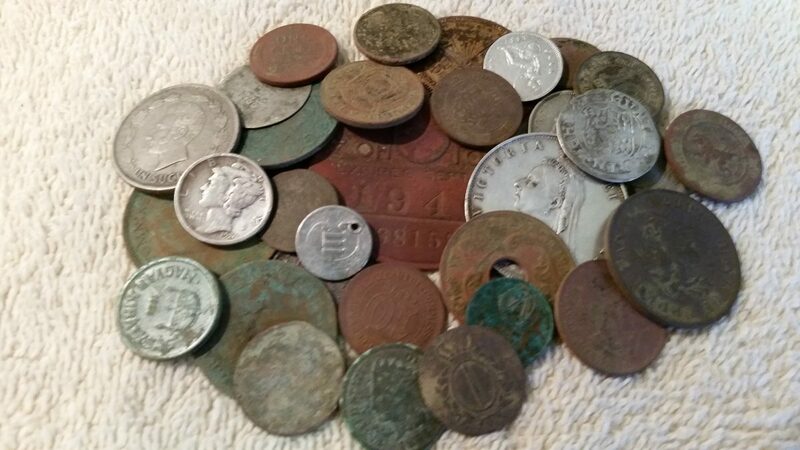 He’s relatively new to metal detecting but has made some pretty outstanding finds and is eager to learn. I’ll try to pass along a little knowledge today, which is what we should all do with new detectorists. Monday is supposed to be an outstanding day, with temps in the mid-70s, and I’ll be out somewhere…right after I mow for the first time this year. Somewhere in that span I’ll have to squeeze in some time to triple-dip the business end of my Pro Pointer AT, an annual task that pays off by extending the life of the instrument. I prefer a product called ‘Plasti-Dip’, a rubbery, tough liquid that dries to the consistency of a bicycle tire and doesn’t affect the pin pointer’s sensitivity. I started doing this two years ago, after watching a YouTube vid of a guy who’d worn a hole in his pin pointer’s casing…not good. That’s what happens when you use the wand as a digging/scraping tool, and it’s not meant for that; I don’t know about you, but I can’t afford to buy a new pin pointer every year. Dipping your pin pointer is relatively easy and can be done every 4 hours if you want multiple coatings. I usually suspend my instrument from a shelf above my work bench using a short length of cord, then dip it in the liquid’s can up to just below the LED light. I slowly withdraw the can ( move the Plasti-Dip can, not the pin pointer ) downward, holding the pointer steady and making sure the overage drips back into the container. Using an empty butter tub, I slide the Plasti-Dip aside and position the reusable butter tub directly under the freshly-dipped pin pointer, ensuring that the suspended tool is steadied and not swinging side to side. Any excess coating material will drip into the tub and can simply be thrown away when the coating process is finished. …which I think is finally here. It was a day I’d looked forward to; a chance to meet a fellow detectorist/YouTuber and do some metal detecting at a late 1800s prison now used as a museum, along with THREE houses built in 1870. I anticipated finding a lot of good stuff with Tom, who goes by Hiluxyota on YT, and couldn’t wait to meet him and get started. It was supposed to be overcast along with the upper-30 degree temps but that was OK by me. This was going to be fun! It was, right up until I backed out of the garage into a light drizzling rain. Well it couldn’t last, I thought as I drove to a retail lot to meet Tom. It did. The guy I’d watched metal detect on his video channel was just as nice in person as he comes across in his recordings. I gave him a little gift, a challenge coin issued by the police department I worked for, with an engraving of the old prison on the reverse side. Fitting, I thought, for where we were going to hunt. Tom followed me to the old Ohio State Reformatory, a looming, castle-like structure that dates to the late 1800s. I was actually in the place once while it was still in use, tagging along with another officer to interview an inmate about some sort of crime. ‘Dank’, ‘dark’ and ‘odorous’ describe my memory of the joint, the cell blocks rising six stories. Most of the back end of the complex is gone now, having been demolished years ago, but the entrance and a good portion of one of the original cell blocks still stands. The OSR Preservation Society owns it now and conducts tours nearly year-round; they also host ghost hunts and have a hugely successful ‘haunted prison’ event in the weeks leading up to Halloween. Most of the movie ‘Shawshank Redemption’ was filmed there, too. I gained permission to metal detect the grounds mainly due to the director having been a past employee of the police department back in the day. We pulled into the lot, only to discover the gates were locked; they weren’t scheduled to open until 10 AM. The three houses, also owned by the OSRPS, were just across the road, so that’s where we started. When we finished with those, back across the state route we went, hitting an area between the prison’s pond and the south perimeter fence. Once we finished up there Tom and I travelled across US 30 a few miles to the abandoned farm I’ve worked the last few months. Aside from clad change, out of the five locations, we got squat. Zilch. Zero. PLUS it was very muddy everywhere but at the prison,so muc so that, when I got home over six hours later, I shed my outer wear in the garage. Then I soaked my aching back in a tub of hot water followed by a nap in the recliner. Disappointed? Hugely, along with a slight dose of embarrassment. I know, no one can control what comes out of the ground, but still you’d think those houses would have produced something…. …and that’s why I went back to the first one today. I knew there had to be something there, and I wasn’t disappointed. Two IHPs, 1889 and 1904, came out of the front yard next to two old pine trees. Author timteamohioPosted on August 16, 2016 August 22, 2016 Leave a comment on WELCOME! I’ve watched a few social media videos of metal detectorists having encounters with law enforcement over the past couple of years and , by and large, the officers involved are mostly curious about the activity we engage in. That’s normal for a police officer. We are inquisitive people and we delve a little further into something we may not be familiar with. Most times in the videos, once we understand why a guy or gal is digging in a park or along a curb strip while carrying a machine we’re not familiar with, we move on…unless there is a law, rule or statute being violated. That’s where the rub is. In the handful of what I hold as ‘anti-police’ metal detecting videos, detectorists have made some pretty outlandish statements and comments…followed by very imflammatory remarks by viewers who obviously hold police in very low regard. I have to think those folks have either had a bad experience with law enforcement in the past or just don’t understand the function of police in today’s societal environment. I speak from experience, having been on both sides of this particular fence. As a detectorist, I understand why I might be approached by a police officer. Usually, they want to know what I’m doing and, after explaining and then showing them some of the trash I’ve removed from, say, a park, they’re satisfied and tell me to have fun as they leave. The biggest suggestion I might have for folks who are approached by law enforcement is to be friendly and respectful. Don’t argue; that’s almost an invitation for trouble and you may find yourself arguing in a court of law. Some of you may invite an event such as that, but how many can afford the cost of an attorney and lost wages because you had to be away from your job in order to state your case to a judge? I’ll be the first to say that there are bad coppers out there, just like there are bad teachers, bad doctors, bad truck drivers…you get the point. Some of these police officers or deputies have no business wearing a badge, period. Here’s what you do to combat that issue: know the law. Get permission before hunting a property. Call or visit your local government administrators and find out if you are permitted to hunt a park, curb strip or lake area, research local laws and statutes to see if metal detecting is permitted on public lands in your area. If approached by law enforcement, give them the name of the person you spoke with who gave you permission or, better still, have in your possession a signed permission document. If they still insist you leave, pack up your gear and go; you can recontact your local government administrator later and explain what happened, allowing them to correct the situation. If you feel you’ve been mistreated by the officer, call the police department or sherrif’s office and ask to speak to a supervisor. Again, DO NOT ARGUE, period. Nothing good will come of it, and I’m sure you have a list of other locations where you know you can metal detect. Remember, if you disrespect police or give them a reason to dislike metal detectorists, you’re not only hurting yourself but also hundreds of thousands of us fellow detectorists. I finally got around to deep-cleaning my metal detecting gear, an annual task that I’ve been putting off because of the mild winter weather us Ohioans have been experiencing. While doing it, I realized just how badly deep-woods bug repellent can damage headphones. If you didn’t already know, the more concentrated repellent will eat plastic and rubber. Kinda makes you wonder how it keeps from doing the same to your skin, doesn’t it? The AT Pro that I use is nearing three years old and, believe me, it’s been used a lot. I’d been very satisfied with its performance until a point last year where I began having problems with the internal electronics of the control unit; a couple of e-mails to Garrett’s customer service department resulted in the unit’s replacement, though the same thing happened about a month after they’d sent me a brand new one. Both times the control head was replaced during smooth interaction with the company and I was very satisfied with the outcome each time; though my machine was less than one month out of warranty that first incident they still covered it. That, folks, is great customer service. A couple of months ago I visited several online metal detecting websites in search of replacement ear pads for my headphones because the ones I had had started to crack badly. I couldn’t find them anywhere. I emailed Hilda at Garrett once again, explaininig what I needed; she reponded that the ear pads aren’t sold individually, but that she would send me new ones, free of charge, as soon as they were back in stock, even though I offered to pay for them. A few weeks later a package arrived in the mail…containing exactly one new pad. I had to chuckle, imagining myself as a one-eared detectorist. I broke down and bought a brand-new Garrett head set; in addition to the ear and head pads being in bad shape, the sound wire connecting the left ‘phone to the right one was cracked, causing me to intermittently lose sound in my left ear. I’d field-fixed it with the roll of black electrical tape I carry in my metal detecting knapsack, repeating the repair several times throughout the season, but it was just time to buy new ones. …and I’ll be extremely careful the next time I apply bug juice to my head and ears before a hunt in the woods or a creek. Yeah, we’ve heard that before and, generally, it’s true; however, when you’re retired like I am the saying is the exception more than the rule. I got out Sunday afternoon for three hours or so, traveling to a wooded area next to a river where I found a Spanish reale last September. I went probably 200 yards beyond where I’d been hunting in previous trips, a flat patch of ground sparsely populated by pine trees, scrub brush and dead, dry reeds. The reeds should have been a tip-off; those things grow mainly in wet or swampy areas, as my boots soon found out. My steps were accompanied by a ‘shluck’-ing sound each time I picked up a foot but, luckily for me, I only had to traverse about twenty yards’ worth of very spongy ground. My boots felt like they weighed ten pounds each. Finally reaching semi-solid ground I activated my Garrett machine, ground-balanced it and started scanning an area near the base of a steep rise. This spot saw a settlement very near by that dates to the early 1800s; none of the buildings or foundations still exist, having been built upon forty years ago. The reale in the river, dated 1786, had purely been a stroke of luck; however its recovery is what keeps me going back to that area. There has to be more. Maybe not reales, but definitely more coins and artifacts. I dug a lot of trash and iron scrap this day. The area is just saturated with so many iron nails, hinges and plain old UFOs…Unidentified Ferrous Objects…that in spots it’s almost impossible to hunt. However…I did find a couple of interesting relics, athough I didn’t know just how interesting until earlier today. The first I knew was probably pretty decent: the wick-burning aperture from a small oil lamp, found in the side of that steep rise and down about four inches. I brushed it off enough to see what it was, then secured it in the large, zippered left-side pocket of the fishing vest I wear when I’m detecting…er, dirt-fishing. The inside of the bottom part of it was packed with dirt and would take some work getting it cleaned. The second decent target turned out to be a silver-plated ( at one time ) old spoon, I’m guessing from the late 1800s by the design on the handle. The handle as well as the bowl section were both bent almost in half, found at about six inches and fifteen yards away from the oil lamp part. It, too, went in the zippered pouch. The rest of the hunt was uneventful and the waist-bag that I keep trash finds in was bulging by the time I made it back to my truck. To top it off, as I lifted the handle on the tailgate to open it…it broke. Daggone plastic parts! This morning, I remembered the finds I’d made were still in the vest, so I gathered my cleaning gear and went to work. Not long after I was rewarded by numbers and letters revealed during cleaning on the thumb wheel…’Pat Sept 8 1862′. Outstanding! Kinda makes all that iron junk worth it. Then there was today. Bright, sunny skies, fifty degrees but extremely strong winds, 20-30 miles per hour with occasional gusts approaching fifty. Not too bad for conditions, right? I didn’t mention that it had rained heavily Monday night into Tuesday, hard enough that there are still puddles of standing water in a couple of low-lying areas of my yard. Nonetheless, finding the date on that oil lamp piece motivated me to get out for awhile around noon, so off I headed to one of my go-to spots…the abandoned farm. Forty-five minutes later I was back home; they may have forecast fifty degrees, but the ‘real-feel’ temp on my phone said it felt like 35. Not having dressed for the wind chill or the wet ground…I sat down to dig a deeper target and discovered just how soaked the earth still was…I packed it in after only having found metallic trash. I needed dry blue jeans anyway. In retirement I picked up a side job, one that only takes a couple of hours a week but provides an immense sense of satisfaction and enables me to interact with true patriot heroes. I write about our veterans from wars past in a weekly newspaper column. Yesterday I had the distinct honor of sitting down with a ninety-two-year-old man who fought in World War Two, a man who had quite a story to tell…not all of it connected to his military service to our country. We conversed for two hours in his living room, in a house that sits on a part of his once 600-acre farm. Much of the land he’d sold off for development once he retired, and the farm now consists of 77 acres. What an opportunity! The farm had been in Jack’s family for well over a century; the original farmhouse, a classic two-story structure from the 1920s, still stands, unoccupied. Jack and his wife, who died four years ago, had built a new home when he’d retired in 2000, on the west edge of the property; the old house sits amongst a collection of smaller buildings used for storage and other farm purposes. “I’d only ask that you let me know when you’re going to be out there”, he said, “so I know it’s not someone I don’t know prowling around on my land.” Though Jack has trouble walking, is blind in one eye and doesn’t hear very well now, I’d taken note of the rifle leaning against a wall next to the rear patio door, one which opens onto a deck that overlooks the old house. Ron and I certainly wouldn’t want to come under fire while detecting with our headphones on, so we’d be sure to stop and visit with Jack for a few minutes prior to working his property. If you’re like me, we’re always keeping a lookout for potential target sites to metal detect. Whether we’re running errands around town or out driving the countryside, our heads are on a perpetual swivel looking for promising ground. Yesterday I caught sight of two spots that, based on research after I got home, should yield some great finds. One is on the west end of town, a spot that’s obscured by shrubbery, overgrowth and trees. I’d noticed it before; yesterday, though, I pulled into a nearby parking lot and jotted down the address. If you don’t already, keep a pocket notepad and pen in your glove box just for this purpose so you won’t forget when you eventually get home. I discovered, by searching the county auditor’s website, that this 4-acre property has a home that was built in 1829, though you wouldn’t know by looking at it; the auditor’s records show that it was remodeled in 1987. It is now abandoned, sitting empty. The owner’s info for this property had a post office box for the address; enter the subscription service I use just for occasions such as this. Up popped the residential address for the property owner, who happens to live near my home. It’ll take some door-knocking but, based on the appearance and age of the target site, I am confident of gaining permission to hunt it. The second spot was one I’d also noted in the past, wondering how old the small home was. It’s located north of the city in a little village crossroads, and it’s also vacant. Though the lot itself is less than a half acre, research showed the structure was built in 1865, the year the Civil War ended. Records also show the owner happens to be the son of a long-time acqaintance of mine, one I became friends with when I first began my law enforcement career back in 1979. Getting permission shouldn’t be a problem on that one. Two more spots added to the list of target sites I keep on my laptop, a list that’s beginning to bulge with promising spots for the coming spring and summer. Searching for History Create a free website or blog at WordPress.com.